Huge stopping power without the huge price tag! The latest and greatest addition to the Pumaspeed Racing product family are the new Pumaspeed Racing Brake discs available in both Grooved and J-Hook disc patterns. Not only do these discs meet OEM specification, they exceed it with an anti-corrosion black coated finish combined with grooves to aid pad deglazing, whilst looking fantastic! 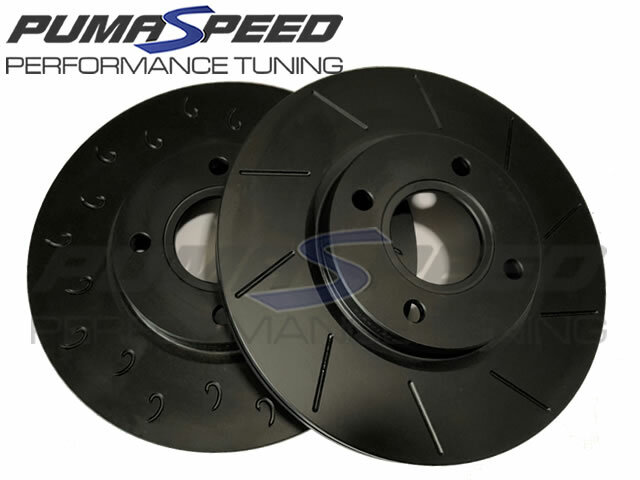 These discs have been engineered to not only improve the look of your car but to dissapate heat as quickly as possible to eradicate brake fade and improve performance whether it be on road or track. The Pumaspeed Workshop team are ready to fit the Pumaspeed Racing Fiesta ST180 Performance Front Discs in our Head Office located here. Therefore making parts and labour a total cost £232.99 (inc. VAT). Pumaspeed have a specialist distribution team that can dispatch the Pumaspeed Racing Fiesta ST180 Performance Front Discs to any destination worldwide.